Mutta Curry refers to one of the many curries from Kerala which is made from hard -boiled eggs cooked with slices of onions, spices, such as chilies, turmeric, garlic, coriander powder, and curry leaves . Sometimes fennel seeds or Masala powder are also used and tomatoes are also added. Potatoes are often added and coconut milk is used for a perfect Kerala flavor. 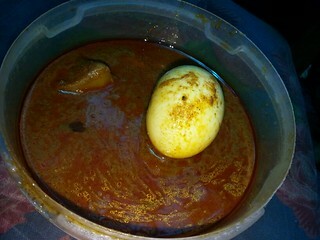 Mutta Curry a very simple and common dish and is almost a part of every traditional Kerala breakfast. Even in some Restaurants around Kerala, this dish is always available for breakfast served with Puttu , Chappati, Idiyappam, Idli or rice. A variation of Mutta Curry is called Varutharacha Mutta Curry where the eggs are cooked almost the same as simple Mutta Curry but in roasted coconut sauce made from roasting grated coconut meat. 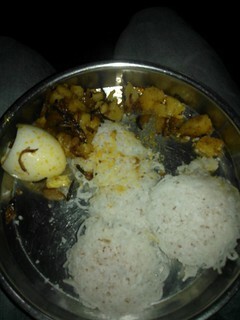 Mutta is the Malayalam word for Egg. Kozhi and Tharavu are Malayalam word for Chicken and Duck, respectively. 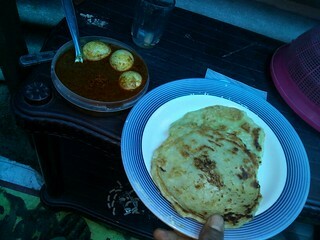 Below are pictures of Mutta Curry which I have tasted in Allepey, Kerala, India. 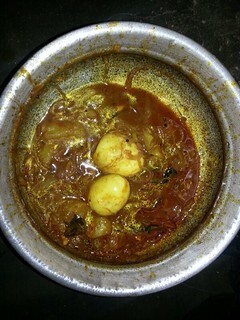 It is one of the easiest Kerala recipe that I have tried cooking while I was on vacation in the Philippines.